INSIDE : Learn how to create DIY watercolor Gem easy artwork for your home or even as a gift. 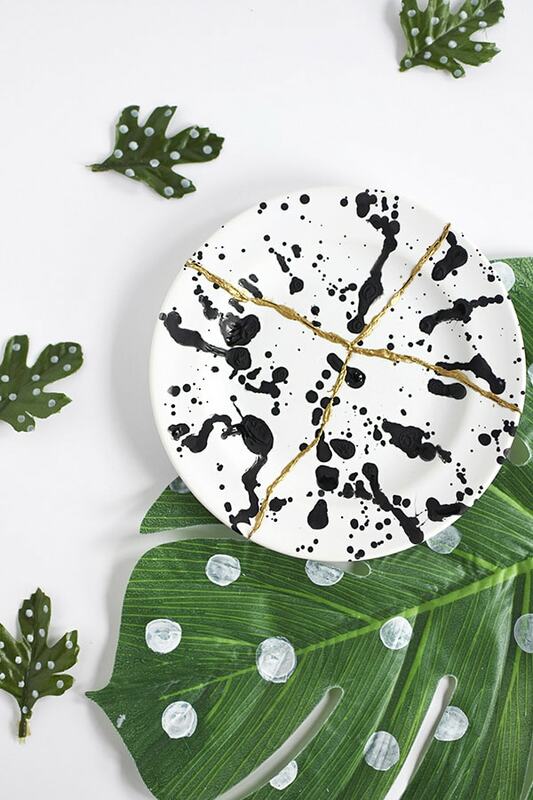 A mixed media piece with a bit of ink pattern makes this a special work of art. Yesterday I took some time with the kiddos to get our watercolor paints out and have a little fun. You might have seen this Instagram pic that is the color inspiration for my daughter’s room. 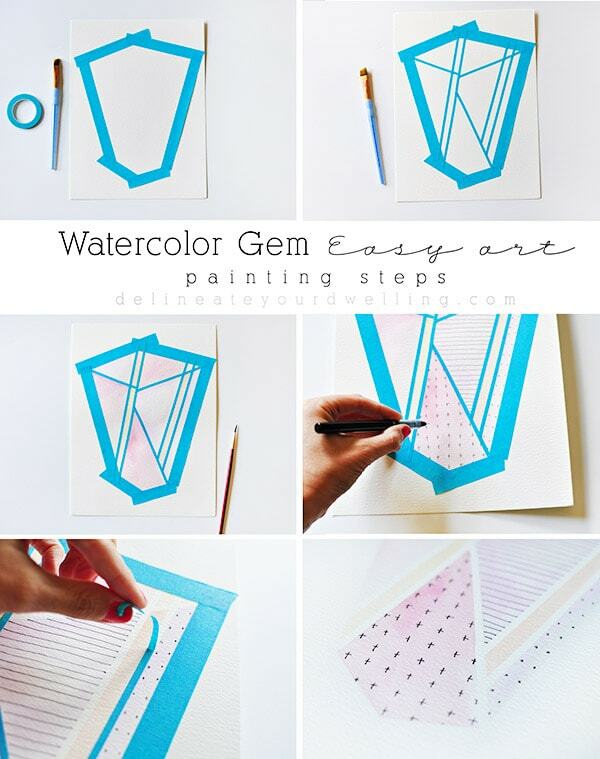 Today I am sharing some Watercolor Gem Easy Art work that will be displayed in her room. 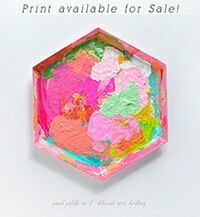 What supplies do I need to create watercolor gem art work? 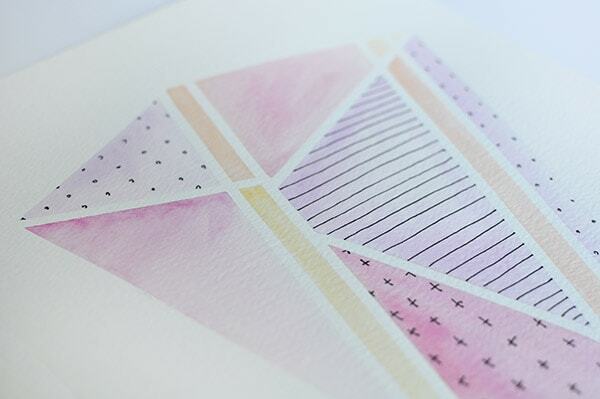 How do I paint a watercolor gem? True to my typical craft style, I did not measure or may anything using a ruler. So throw those rulers out the window and get creative with me! 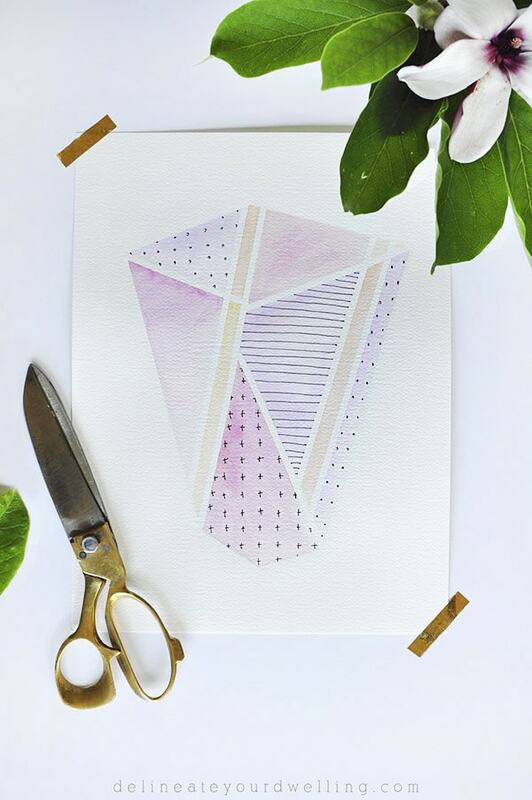 Using Martha’s thicker stencil tape, I laid out the basic shape for my watercolor gem. Then, I used a thinner, patterning tape to create shapes within my gem. 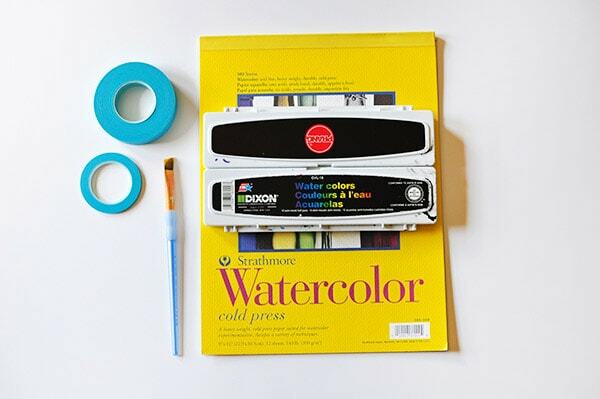 Make sure to push on all edges to ensure a clean edge with your watercolor. Next, using orange, yellow, purple and fuchsia I filled in each small shape with a simple wet wash technique. 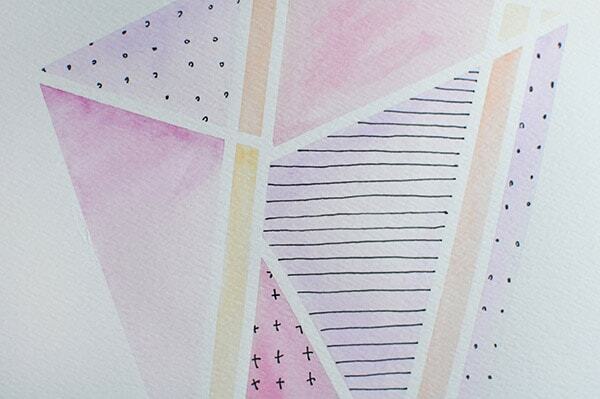 After the paint had dried, I used a thin point pen to doodle some designs overtop the watercolor. I left some spaces blank to not make the painting too busy. Lastly, remove your tape and enjoy the crisp white lines. I love the girlie colors and patterns. I think it will go so perfectly in my daughter’s new “big girl room”…. she’s four, so it’s all relative! Enjoy this simple art how-to? You can see my other Easy Art in 1.2.3. posts here! So cute tutorial!!! Thanks for sharing!!! This is so great! Might have to stop by Michael’s on the way home to pick up some water colors. This looks like something you’d buy! 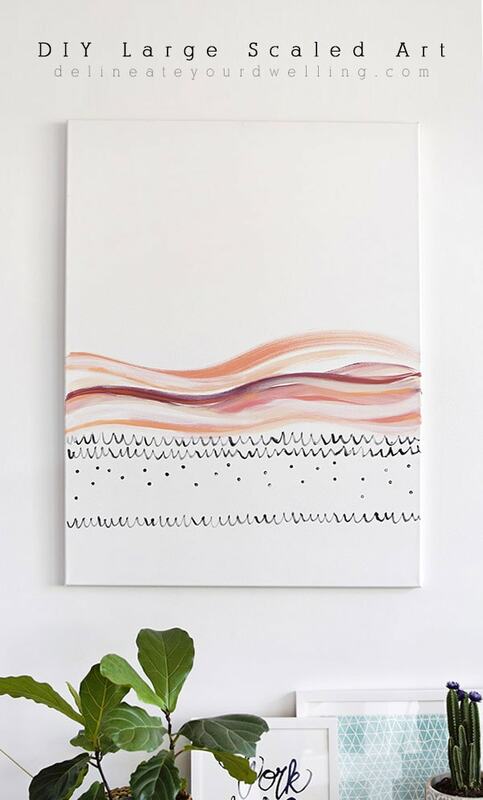 With only a few simple steps you can create this Watercolor Gem Easy Artwork, which is perfect for any room in your home! 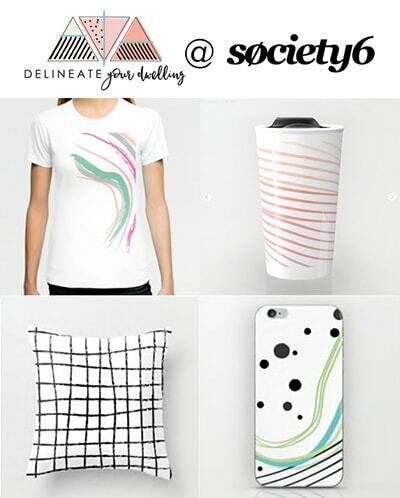 This was made by Amy from Delineate Your Dwelling. I love this! I am going to give this a try for sure! Haha, thanks for your vote of approval Stephanie! =) It’s all fancy because of the tape, you can totally do it! I’ll stop by your link party now. Thanks. Thanks so much Carmia! I need more gems in my life and painting them is an expensive way, ha! Wow. I love watercolor art but am so intimidated. This is just gorgeous! Thanks for the tutorial and for sharing at the Pretty Preppy Party! So simple! Love it! I’m actually looking into new decorations for my wall so I will definitely keep this one in mind. Thanks for sharing! Thank you for your kind words, Paola!! Your art piece is so beautiful!! Love, love love!! Thanks so much for your sweet comment, Vesna! I love this Amy! Fantastic design! Such a complement coming from the master painter! Thanks Aniko!